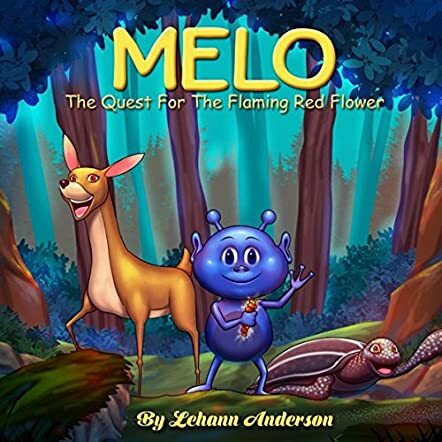 Melo: The Quest for the Flaming Red Flower by Lehann Anderson is a beginning reader’s book about adventure, outer space quests, and making new friends. In it we meet Melo, a cute blue alien from Mars who lives a life much like a child on Earth. He learns about Earth in school and dreams of visiting, as children here study other places and long to see them. Melo has friends, teachers, a happy life. But when one of his teachers takes the whole class on a field trip to Earth in search of a mythical flower, Melo gets separated from his classmates. He makes new friends, which is good because they’ll need to help him with more than his quest. This delightful story has a fun, child-centered take on outer space and a narrative that’s meticulous and multi-layered for a book in this age bracket. Melo: The Quest for the Flaming Red Flower offers some fantasy, some sci-fi, gorgeous illustrations that bring the world of spunky, enthusiastic Melo to life, and a lovable little hero who’s all gung-ho to see the world and certainly reminded me of myself at that age. Lehann Anderson brings Melo’s emotions to the forefront as he journeys amid fantasy scenarios in a simple, daily way. In spite of his blue skin, Melo is actually very human, and children will see themselves in him—cheerful, friendly, and truly boundlessly curious. Every child’s imagination and ability to explore has the potential to stretch to distant planets (if only their parents and teachers had the spaceships to take them there!) and the sudden friendships Melo makes are resonant and realistic to kids, who often find old friends disappearing and new people taking their place in a sudden way.